Locally we service San Clemente, San Juan Capistrano & Dana Point. Up the coast of Orange County into Laguna Beach, Corona del Mar & Newport Beach. Our clients also live in Laguna Niguel, Ladera Ranch & Mission Viejo. Timo, owner of Leak Star Advanced Leak Detection is a leak detection specialist, fully licensed & bonded plumber servicing San Diego & Orange County. Timo can be reached 24 hours a day for your emgency leaak detection services. We specialize in advanced leak detection, slab leak detection & related plumbing repairs including rerouting and repiping service. The need for water line repairs should not be ignored. 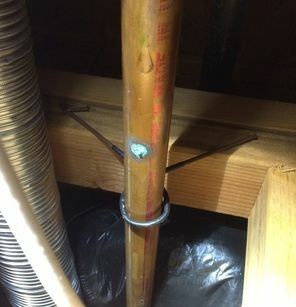 Left untreated a copper leak, sewer leak or even a slab leak can cause severe damage to the structure of your home or place of business. Mold damage can begin to happen in 12-24 hrs. and that is trouble you want to avoid. As a full service plumbing and advanced leak detection specialist and slab leak repair company, our friendly & knowledgeable staff will be with you every step of the way. From the moment we enter your home or business to assess your water leak, all the way through working with your insurance company, to clean up water damage, we will be there. First we will do your leak detection & then repair your water leak in order to prevent further water damage. Immediately after we can begin cleaning up the water damage. Mold? Not a problem we are fully qualified to do your mold removal and mold remediation as well. Our technicians are trained to use minimally invasive techniques. Whether locating your leak or cleaning up water damage or mold, we will remove only what is absolutely necessary. Using infrared cameras, moisture detectors & sound equipment we can often locate a leak without even cutting a single hole. We can even see a hot water slab leak under concrete, or a sewer leak or tiny pinhole water leak behind your walls. We use moisture mapping to remove as little drywall as absolutely necessary. This will make your insurance company happy & your wallet too when it comes to paying for repairs. Once the situation has been accessed you will be completely informed of your slab leak repair options. If you need help with your insurance company we will do everything we can with the knowledge we have to help you get the remimbursment you deserve. If you suspect a water leak or slab leak detection, call for a professional opinion. Water damage can't always be helped, but if you need mold removal and mold remediation, your insurance company may decline your claim. Mold can be an indication of negligence in their eyes. If you find yourself in this situation we may be able to able to help. Call us first. ​​​We understand how stressful any disruption to your home or business can be. Your qualifying plumber, Timo at Leak Star Advanced Leak Detection wants to help make it as painless as he can. We have decades of happy customers who have helped us earn our reputation as professional, knowledgeable and friendly leak detection specialists all over San Diego & Orange County. Our coverage extends up the coast, from La Jolla, Encinitas, Carlsbad, San Clemente & San Juan Capistrano to homeowners inland like Escondido, Poway & Ladera Ranch. They have all helped us earn our 5 Star Yelp & Google Reviews.